So a couple of weeks ago I was in a pretty major funk. Things on the school front were not looking well (my funding was pulled over an administrative mistake–it’s back, thank god), the poet was out of town and we’d had a tiff before he left, and I was not in the mood to face life. So I reverted to my old funk tactics. I checked three 200+ page books out of the library and vowed to stay in bed (it’s 90+ degrees outside, ewww) until I read them all. A book a day. But one needs sustenance when huddled in bed with the A/C on high, cats cuddled around legs. You need chocolate chip cookies. It’s the only funk food that will suffice. I riffed off the recipe from The Joy of Vegan Baking, which, honestly, I’m not too fond of. But it could remind me of the correct flour and sugar measurements and such. And with pitachios sitting around in my cupboard, well, you can imagine how this recipe turned out. DELICIOUS. It satisfied my craving almost as well as the original eggy chocolate chip cookie recipe I made for years. I’ve yet to find a vegan chocolate chip cookie that passes muster, but this wasn’t too bad. As a note, I might suggest lessening the sugar to 1/2 and 1/2 with a pinch thrown in or something like that if you use vanilla yogurt like I did. I might also lessened the vanilla a bit. I don’t like my cookies super sweet, and these were a bit on the edge of too sweet for me. Other than that, I like using the yogurt as an egg replacer. In a large bowl, cream the butter, sugars, and vanilla. Add the soy yogurt and mix well. Beat in the flour, baking soda, and salt in small batches until it forms a dough. You might need to add more flour. When it is thoroughly combined, add the chocolate chips and pistachios. Form small balls of dough and place on a non-stick cookie sheet. Bake for 8-10 minutes or until the golden brown you want. Let them cool as long as you can wait–I suggest not waiting so as to get the perfect combo of hot dough and gooey chocolate chips. sorry to hear you were in a funk, but kudos for finding ways to take you of it. your cookies would undoubtedly make even the grouchiest/most depressed person out there want to burst into songs. pistachio cookies! oh, you just made me and mi marido very happy. and you are a bike-ridding, eco-trippin’ vegan ecologist? oh dear you just made my day! 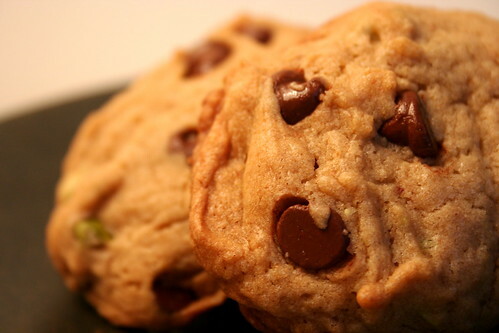 pistachios in chocolate chip cookies is brilliance! brilliance, I say! besides the obvious brilliance of using books and a bed as a needed escape from the world, I am so behind that one, too. hope the cookies (and lit) is helping! Hope you have de-funkafied thein self with your most excellent invention (some good reads don’t hurt either)! So glad that your funding has been restored! Mm, sounds like comfort food to me. Hope you’re feeling better and out of your funk now! This is not what I need to be seeing right now (I’m a chocolate chip cookie ADDICT, which is causing me to pack on the pounds as of late)…but boy, do these look delicious!! The next time I lock myself in my house with books, cold a/c and cuddly dogs, I am going to make these. They definitely look like mood lifters!